Baytril Taste Tabs are a broad-spectrum antibiotic that effectively treats canine bacterial infections of the skin, lungs, liver, GI and urinary tract, as well as the prostate. Baytril's flavored tablets ensure greater pet compliance in taking the medication. 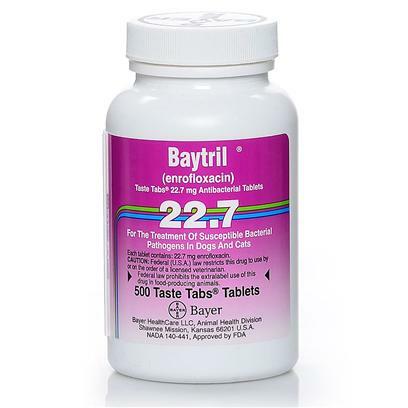 Baytril is a fluroquinolone antibiotic that can be used to treat bacterial infections that target the skin, urinary tract, lungs, GI tract, liver, and prostate. Baytril requires a prescription from your veterinarian. Baytril is sold per tablet. If there are signs of an allergic reaction occur such as: skin rash, hives, difficulty breathing; throat, face lips, ton or throat swelling. Seek emergency care if allergy symptoms are severe. Contact your veterinarian if symptoms worsen or behavior is negatively impacted. It is not for use in dogs and cats that are nursing or may be pregnant. Typically less severe reactions are seen such as loss of appetite, vomiting, diarrhea, dizziness, or drowsiness. Continue medication if these symptoms occur, but alert your vet to these complications or if the side effects that seem to hinder normal pet activity and behavior. Baytril may be less effective or may reactive negatively when combined with antacids/ sucralfate, vitamin/mineral products, or dairy products. Take precaution by waiting at least 2 hours between giving any of the above with Baytil Taste Tabs for Cats and Dogs. Use a prescribed by your veterinarian. Do not skip doses. Use the complete amount prescribed by your veterinarian. Give as either a single dose, or if your animal has trouble chewing break it into two doses. Allow for fresh water to be available upon time of dosage.